How Long Can You Take to File Response Papers in a Divorce Case in California? Responding to the receipt of divorce papers is just as important as filing paperwork initiating the divorce. California law provides that in your response in a divorce case, you may address the facts alleged in the initial filing; you may also mention facts not addressed in the initial filing, and you may even make a claim that the court does not have the power to decide the matter. A spouse served with divorce papers ordinarily has 30 days in which to respond in California. The 30-day response period begins on the first day after the papers were served. A response is considered incomplete if it does not include all applicable papers. If the party who filed for divorce, called the “petitioner,” is represented by an attorney, you must deliver a copy of the response paperwork to the attorney. If the petitioner is not represented by an attorney, you must serve the petitioner with the response paperwork. The parties may extend the minimum response period by agreement. Although not required, such an agreement should be in writing to prevent the petitioner from later denying the existence of such an agreement. If you and your spouse agree to extend the response period, the petitioner may not proceed with the divorce case until either the response is filed or the extended time period has elapsed. California does not require a petitioner to wait for an indefinite period of time for you to file a response. Once the minimum response period has expired, the petitioner may file a request for entry of default judgment. A default judgment informs that court that you failed to file a response, that the minimum response period has expired, and that the petitioner wishes to move forward with the case. If the court approves the request, it will convert the petitioner’s documents to a court order. The petitioner cannot request a default judgment on matters not requested in her paperwork. For example, if the petitioner did not request child support in her divorce papers, the court may not order you to pay child support. The most common document that is filed in response to a divorce petition is called a “response.” The response paperwork closely tracks the language the petitioner used in her divorce petition. You may agree to some or all of the requests made in the petition. A response may also request something that the petition paperwork was silent about. For example, even if the petitioner did not mention spousal support, the respondent may request spousal support in his response. When you respond, you may instead decide to respond with a “motion to quash” rather than with a response. A motion to quash states your belief that the court does not have personal jurisdiction over you, or that the petitioning party did not follow the legal requirements of serving the respondent with the divorce papers. Personal jurisdiction refers to the power of a court to make a decision that affects you. For example, if a divorce petition filed in California requests the court to order you to pay child support, and if you do not live in California and have no significant relationship with California, a California court would probably lack jurisdiction over you and would not be able to make an enforceable order that awards child support. Although a response is made on fill-in-the-blank forms available throughout the state, there is no standardized motion to quash form. If you wish to file a motion to quash, you might be best served by consulting an attorney or using a third-party legal document service. What if My Wife Defaults in a Divorce in California? 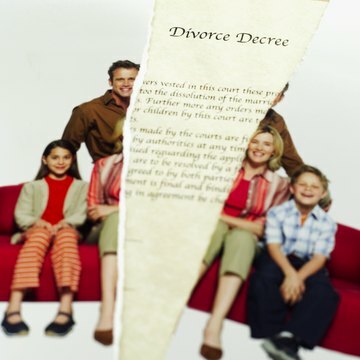 Each state has unique laws regarding divorce and family law matters, so the actual process of preparing and filing divorce documents is determined by state civil procedure laws and local court rules. The term "divorce documents" may include the petition or complaint for divorce, motions for support and custody, stipulated property divisions, and final settlements and decrees. In general, divorce documents are commonly referred to as “pleadings” or “court filings."